Listen to the podcast. Find it on iTunes/iPod and Podcast.com. Read a full transcript or download a copy. Sponsor: Platform Computing. Get a complimentary copy of the Forrester Private Cloud Market Overview from Platform Computing. The popularity of cloud concepts and the expected benefits from cloud computing have certainly raised expectations. Forrester now predicts that cloud spending will grow from $40 billion to $241 billion in the global IT market over the next 10 years, and yet, there's still a lot of confusion about the true payoffs and risks associated with cloud adoption. IDC has it's own numbers. Some enterprises expect to use cloud and hybrid clouds to save on costs, improve productivity, refine their utilization rates, cut energy use and eliminate gross IT inefficiencies. At the same time, cloud use should improve their overall agility, ramp up their business-process innovation, and generate better overall business outcomes. To others, this sounds a bit too good to be true, and a backlash against a silver bullet, cloud hype mentality is inevitable and is probably healthy. Yet, we find that there is also unfounded cynicism about cloud computing and underserved doubt. So, where is the golden mean, a proper context for real-world and likely cloud value? And, what are the roadblocks that enterprises may encounter that would prevent them from appreciating the true potential for cloud, while also avoiding the risks? We assembled a panel to identify and debunk myths on the road to cloud-computing adoption. Such myths can cause confusion and hold IT back from embracing cloud model sooner rather than later. We also define some clear ways to get the best out of cloud virtues without stumbling. Gardner: Let's begin to tackle some of the cloud computing myths. Private cloud, to put a usable definition to it, is a web-manageable virtualized data center. What that means is that through any browser you can manage any component of the private cloud. There's an understanding that virtualization is private cloud and private cloud is virtualization. Clearly, that's not the case. Help me understand what you perceive in the market as a myth around virtualization and what should be the right path between virtualization and a private cloud? Parker: Private cloud, to put a usable definition to it, is a web-manageable virtualized data center. What that means is that through any browser you can manage any component of the private cloud. That's opposed to virtualization, which could just be a single physical host with a couple of virtual machines (WMs) running on it and doesn't provide the redundancy and cost-effectiveness of an entire private cloud or the ease of management of a private cloud. So there is a huge difference between virtualization and use of a hypervisor versus an entire private cloud. A private cloud is comprised of virtualized routers, firewalls, switches, in a true data center not a server room. There are redundant environmental systems, like air-conditioning and Internet connections. It’s comprised of an entire infrastructure, not just a single virtualized host. Moving to a private cloud is inevitable, because the benefits so far outweigh the perceived risks, and the perceived risks are more toward public cloud services than private cloud services. Gardner: We’ve heard about fear of loss of control by IT. Is there a counter-intuitive effect here that cloud will give you better control and higher degrees of security and reliability? Parker: I know that to be a fact, because the private cloud management software and hypervisors provide redundancy and performance monitoring that a lot of companies don't have by default. You don’t only get performance monitoring across a wide range of systems just by installing a hypervisor, but by going with a private cloud management system and the use of VirtualCenter that supports live motion between physical hosts. It also provides uptime/downtime type of monitoring and reporting capacity planning that most companies don't even attempt, because these systems are generally out of their budget. Gardner: Tell us about Fetch Technologies. Parker: Fetch Technologies is a provider of data as a service, which is probably the best way to describe it. We have a software-as-a-service (SaaS) type of business that extracts formats and delivers Internet-scale data. For example, two of our clients are Dow Jones and Shopzilla. Gardner: Let’s go next to Ajay. A myth that I encounter is that private clouds are just too hard. "This is such a departure from the siloed and monolithic approach to computing that we'd just as soon stick with one server, one app, and one database," we hear. "Moving toward a fabric or grid type of affair is just too hard to maintain, and I'm bound to stumble." Why would I be wrong in assuming that as my position, Ajay? The fear of the operations being changed is one of the key issues that IT management sees. They also think of staff attrition as a key issue. Patel: One of the main issues that the IT management of an organization encounters on a day-to-day basis is the ability for their current staff to change their princip les of how they manage the day-to-day operations. The training and the discipline need to be changed. The fear of the operations being changed is one of the key issues that IT management sees. They also think of staff attrition as a key issue. By doing the actual cloud assessment, by understanding what the cloud means, it's closer to home to what the IT infrastructure team does today than one would imagine through the myth. For example, virtualization is a key fundamental need of a private cloud -- virtualization at the servers, network and storage. All the enterprise providers at the servers, networks, and storage are creating a virtualized infrastructure for you to plug into your cloud-management software and deliver those services to a end-user without issues -- and in a single pane of glass. If you look at the some of the metrics that are used by managed service companies, SIs, and outsourcing companies, they do what the end-user companies do, but they do it much cheaper, better and faster. How they do it better is by creating the ability to manage several different infrastructure portfolio components in a much more efficient manner. That means managing storage as a virtualized infrastructure; tier storage, network, the servers, not only the Windows environment, but the Unix environment, and the Linux environment, including all that in the hands of the business-owners. Today, with the money being so tight to come by for a corporation, people need to look at not just a return on investment (ROI), but the return on invested capital. You can deploy private cloud technologies on top of your virtualized infrastructure at a much lower cost of entry, than if you were to just expand utilizing the islands of bills of test, dev environment, by application, by project. Gardner: I'd like to hear more about Agilysys? What is your organization and what is your role there as a technology leader? You can deploy private cloud technologies on top of your virtualized infrastructure at a much lower cost of entry. Patel: I am the technology leader for cloud services across the US and UK. Agilysys is a value-added reseller, as well as a system integrator and professional services organization that services enterprises from Wall Street to manufacturing to retail to service providers, and telecom companies. Gardner: And do you agree, Ajay, with Forrester Research and IDC, when they show such massive growth, do you really expect that cloud, private cloud, and hybrid cloud are all going to be in such rapid growth over the next several years? Patel: Absolutely. The only difference between a private cloud and public cloud, based on what I'm seeing out there, is the fear of bridging that gap between what the end-user attains via private cloud being inside their four walled data center, to how the public cloud provides the ability for the end-user to have security and the comfort level that their data is secure. So, absolutely, private to hybrid to public is definitely the way the industry is going to go. Gardner: Jay at Platform, I'm thinking about myths that have to do with adoption, different business units getting involved, lack of control, and cohesive policy. This is probably what keeps a lot of CIOs up at night, thinking that it’s the Wild West and everyone is running off and doing their own thing with IT. How is that a myth and what does a private cloud infrastructure allow that would mitigate that sense of a lot of loose cannons? Muelhoefer: That’s a key issue when we start thinking about how our customers look to private cloud. It comes back a little bit to the definition that Rick mentioned. Does virtualization equal private cloud -- yes or no? Our customers are asking for the end-user organizations to be able to access their IT services through a self-service portal. But a private cloud isn’t just virtualization, nor is it one virtualization vendor. It’s a diverse set of services that need to be delivered in a highly automated fashion. Because it's not just one virtualization, it's going to be VMware, KVM, Xen, etc. A lot of our customers also have physical provisioning requirements, because not all applications are going to be virtualized. People do want to tap in to external cloud resources as they need to, when the costs and the security and compliance requirements are right. That's the concept of the hybrid cloud, as Ajay mentioned. We're definitely in agreement. You need to be able to support all of those, bring them together in a highly orchestrated fashion, and deliver them to the right people in a secure and compliant manner. The challenge is that each business unit inside of the company typically doesn’t want to give up control. They each have their own IT silos today that meet their needs, and they are highly over provisioned. Some of those can be at 5 to 10 percent utilization, when you measure it over time, because they have to provision everything for peak demands. And, because you have such a low utilization, people are looking at how to increase that utilization metric and also increase the number of servers that are managed by each administrator. You need to find a way to get all the business units to consolidate all these underutilized resources. By pooling, you could actually get effects just like when you have a portfolio of stocks. You're going to have a different demand curve by each of the different business units and how they can all benefit. When one business unit needs a lot, they can access the pool when another business unit might be low. You need to find a way to get all the business units to consolidate all these underutilized resources. But, the big issue is how you can do that without businesses feeling like they're giving up that control to some other external unit, whether it's a centralized IT within a company, or an external service provider? In our case, a lot of our customers, because of the compliance and security issues, very much want to keep it within their four walls at this stage in the evolution of the cloud marketplace. So, it’s all about providing that flexibility and openness to allow business units to consolidate, but not giving up that control and providing a very flexible administrative capability. That’s something that we've spent the last several years building for our customers. It’s all about being able to support that heterogeneous environment, because every business unit is going to be a little different and is going to have different needs. Allowing them to have control, but within a defined boundaries, you could have centralized cloud control, where you give them their resources and quotas for what they're initially provisioned for, and you could support costing and charge back, and provide a lot more visibility in to what’s happening. You get all of that centralized efficiency that Ajay mentioned, but also having a centralized organization that knows how to run a larger scale environment. But then, each of the business units can go in and do their own customized self-service portal and get access to IT services, whether it's a simple OS or a VM or a way to provision a complex multi-tier application in minutes, and have that be an automated process. That’s how you get a lot of the cost efficiencies and the scale that you want out of a cloud environment. Gardner: And, for those business units, they'd also have to watch the cost and maybe have their own P&L. They might start seeing their IT costs as a shared services or charge-backs, get out of the capital expense business, and so it could actually help them in their business when it comes to cost. Muelhoefer: Correct. Most of our customers today are very much still in evolution. The whole trend towards more visibility is there, because you're going to need it for compliance, whether it’s Sarbanes-Oxley (SOX) or ITIL reporting. Ultimately, the business units of IT are going to get sophisticated enough that they can move from being a cost center to a value-added service center. Then, they can start doing that granular charge-back reporting and actually show at a much more fine level the value that they are adding to the organization. Parker: Different departments, by combining their IT budgets and going with a single private cloud infrastructure, can get a much more reliable infrastructure. By combining budgets, they can afford SAN storage and a virtual infrastructure that supports live VMotion. They get a fast response, because by putting a cloud management application like Platform on top it, they have much more control, because we are providing the interface to the different departments. They can set up servers themselves and manage their own servers. They have a much faster "IT response time,” so they don’t really have to wait for IT’s response through a help desk system that might take days to add memory to a server. IT gives end-users more control by providing a cloud management application and also gives them a much more reliable, manageable system. We've been running a private cloud here at Fetch for three years now, and we've seen this. This isn’t some pie-in-the-sky kind of thing. This is, in fact, what we have seen and proven over and over. They have a much faster "IT response time,” so they don’t really have to wait for IT’s response through a help desk system that might take days to add memory to a server. Gardner: I asked both Ajay and Rick to tell us about their companies. Jay, why don’t you give us the overview of Platform Computing? Muelhoefer: Platform Computing is headquartered in Toronto, Canada and it's about an 18-year-old company. We have over 2,000 customers, and they're spread out on a global basis. We have a couple of different business units. One is enterprise analytics. Second, is cloud, and the third is HPC grids and clusters. Within the cloud space, we offer a cloud management solution for medium and large enterprises to build and manage private and hybrid cloud environments. The Platform cloud software is called Platform ISF. It's all about providing the self-service capability to end-users to access this diverse set of infrastructure as a service (IaaS), and providing the automation, so that you can get the efficiencies and the benefits out of a cloud environment. Gardner: Rick, let’s go back to you. I've heard this myth that private clouds are just for development, test, and quality assurance (QA). Is cloud really formed by developers and it’s being getting too much notoriety, or is there something else going that it’s for test, dev, and a whole lot more? Parker: I believe that myth just came from the initial availability of VMware and that’s what it was primarily used for. That’s the beginning of that myth. My experience is that our private cloud isn't a specific use-case. A well designed private cloud should and can support any use case. We have a private cloud infrastructure and on top of this infrastructure, we can deliver development resources and test resources and QA resources, but they're all sitting on top of a base infrastructure of a private cloud. But, there isn't just a single use case. It’s detrimental to define use cases for private cloud. I don't recommend setting up a private cloud for dev only, another separate private cloud for test, another separate private cloud for QA. That’s where a use case mentality gets into it. You start developing multiple private clouds. If you combine those resources and develop a single private cloud, that lets you divide up the resources within the infrastructure to support the different requirements. So, it’s really backward thinking, counter-intuitive, to try to define use cases for private cloud. We run everything on our private cloud. Our goal is 100 percent virtualization of all servers, of running everything on our private cloud. That includes back-office corporate IT, Microsoft Exchange services like domain controllers, SharePoint, and all of these systems run on top of our private cloud out of our data centers. We don't have any of these systems running out of an office, because we want the reliability that the cost savings that our private cloud gives us to deploy these applications on servers in the data center where these systems belong. Muelhoefer: Some of that myth is maybe because the original evolution of clouds started out in the area of very transient workloads. By transient, I mean like a demonstration environments. or somebody that just needs to do a development environment for a day or two. But we've seen a transition across our customers, where they also have these longer-running applications that they're putting in the production type of environments, and they don't want to have to over-provision them. At the end of the quarter, you need to have a certain capacity of 10 units, you don’t want to have that 10 units throughout the entire quarter as resource-hogs. You want to be able to flex up and flex down according to the requirements and the demand on it. Flexing requires a different set of technology capabilities, having the right sets of business policies and defining your applications so they can dynamically scale. I think that’s one of the next frontiers in the world of cloud. We've seen with our customers that there is a move toward different application architectures that can take advantage of that flexing capability in Web applications and Java applications. They're very much in that domain, and we see that the next round of benefits is going to come from the production environments. But it does require you to have a solid infrastructure that knows how to dynamically manage flexing over time. It’s going to be a great opportunity for additional benefits, but as Rick said, you don't want to build cloud silos. You don't want to have one for dev, one for QA, one for help desk. You really need a platform that can support all of those, so you get the benefits of the pooling. It's more than just virtualization. We have customers that are heavily VMware-centric. They can be highly virtualized, 60 percent-plus virtualized, but the utilization isn’t where they need it to be. And it's all about how can you bring that automation and control into that environment. Gardner: Next myth, it goes to Ajay. This is what I hear more than almost any other: "There is no cost justification. The cloud is going to cost the same or even more. Why is that cynicism unjustified? Patel: One of the main things that proves to be untrue is that when you build a private cloud, you're pulling in the capabilities of the IT technology that is building the individual islands of environments. On top of it, you're increasing utilization. Today, in the industry, I believe the overall virtualization is less than 40 percent. If you think about it, taking the less-than-40 percent virtualized environment, the remaining is 60 percent. Even if you take 30 percent, which is average utilization -- 15-20 percent in the Windows environment. By putting it on a private cloud, you're increasing the utilization to 60 percent, 70 percent, 80 percent. If you can hit at 85 percent utilization of the resources, now you are buying that much less of every piece of hardware, software, storage, and network. When you pool all the different projects together, you build an environment. You put the right infrastructure in place with the ability to service your business, what you do successfully. You end up saving minimally 20 percent, if you just keep the current service level agreements (SLAs) and current deliverables, the way you do today. But, if you retrain your staff to become cloud administrators -- to essentially become more agile in the ability to create the workloads that are virtual-capable versus standalone-capable -- you get much more benefit, and your cost of entry is minimally 20-30 percent lower on day one. Going forward, you can get more than 50 percent lower cost. [Private cloud] is killing two birds with one stone, because not only can you re-utilize your elasticity of a 100,000 square-foot facility of data center, but you can now put in 2-3 times more compute capacity without breaking the barriers of the power, cooling, heating, and all the other components. And by having cloud within your data center, now the disaster-recovery capabilities of cloud failover is inherent in the framework of cloud. You no longer have to worry about individual application-based failover. Now, you're looking at failing over an infrastructure instead of applications. And, of course, the framework of cloud itself gives you a much higher availability from the perspective of hardware up-time and the SLAs than you can obtain by individually building sets of servers with test, dev, QA, or production. Operationally beyond the initial set up of the private cloud environment, the cost to IT, in an environment and the IT budget goes down drastically on the scale based on our interaction to end-users and our cloud providers is anywhere from 11 days to 15 days down to 3-4 hours. This means that the hardware is sitting on the dock in the old infrastructure deployment model, versus the cloud model. And when you take three to four hours down into individual components it takes one to two to three days to build the server, rack it, power it, connect it. It takes 10 minutes today within the private cloud environment to install the operating system. It used to take one to two days, maybe two-and-a-half days, depending on the patches and the add-ons. It takes 30 to 60 minutes starting with a template that is available within private cloud and then setting up the dev environments at the application layer, goes down from days down to 30 minutes. When you combine all that, the operational efficiency you gain definitely puts your IT staff at a much greater advantage than your competitor. Gardner: Ajay just pointed out that there is perhaps a business continuity benefit here. If your cloud is supporting infrastructure, rather than individual apps, you can have failover, reliability, redundancy, and disaster recovery at that infrastructure level. Therefore, having it across the board. In most cases, a number of the components of a private cloud is just redeployed existing hardware, because the cloud network is more of a configuration than the specific cloud hardware. What's the business continuity story and does that perhaps provide a stepping stone to hybrid types of computing models? Parker: To backtrack just a little bit, at Fetch Technologies, we've cut our data-center cost in half by switching to a private cloud. That's just one of the cost benefits that we've experienced. Going back to the private cloud cost, one of the myths is that you have to buy a whole new set of cloud technology, cloud hardware, to create a private cloud. That's not true. In most cases, a number of the components of a private cloud is just redeployed existing hardware, because the cloud network is more of a configuration than the specific cloud hardware. In other words, you can reconfigure existing hardware into a private cloud. You don't necessarily need to buy, and there is really no such thing as specific cloud hardware. There are some hardware systems and models that are more optimal in a private cloud environment, but that doesn't necessarily mean you need to buy them to start. You get some initial cost savings, do virtualization to pay for maybe more optimal hardware, but you don't have to start with the most optimal hardware to build a private cloud. As far as the business continuity, what we've found is that the benefit is more for up-time maintenance than it is for reliability, because most systems are fairly reliable. You don't have servers failing on a day-to-day basis. We have systems, at least one server, that's been up for two years with zero downtime. For updating firmware, we can VMotion servers and virtual machines off to other hosts, upgrade the host, and then VMotion those virtual servers back on to the upgraded host so we have a zero downtime maintenance. That's almost more important than reliability, because reliability is generally fairly good. Gardner: Is there another underlying value here that by moving to private cloud, it puts you in a better position to start leveraging hybrid cloud, that is to say more SaaS or using third-party clouds for specific IaaS and/or maybe perhaps over time moving part of your cloud into their cloud. Is there a benefit in terms of getting expertise around private cloud that sets you up to be in a better position to enjoy some of the benefits of the more expensive cloud models? We offer a way to provide a unified view of all your IT service usage, whether it's inside your company being serviced through your internal organization or potentially sourced through an external cloud. Muelhoefer: That's a really interesting question, because one of the main reasons that a lot of our early customers came to us was because there was uncontrolled use of external cloud resources. If you're a financial services company or somebody else who has compliance and security issues and you have people going out and using external clouds and you have no visibility into that, it's pretty scary. We offer a way to provide a unified view of all your IT service usage, whether it's inside your company being serviced through your internal organization or potentially sourced through an external cloud that people may be using as part of their overall IT footprint. It's really the ability to synthesize and figure out -- if an end user is making a request, what's the most efficient way to service that request? Is it to serve up something internally or externally, based upon the business policies? Is it using very specific customer data that can't go outside the organization? 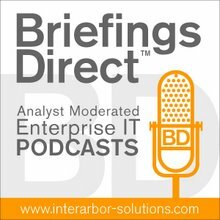 Does it have to use a certain type of application that goes with it where there's a latency issue about how it's served, and being able to provide a lot of business policy context about how to best serve that whether it's a cost, compliance, or security type of objective that you’re going against? That’s one key thing. Another important aspect we do see in our customers is the disaster recovery and reliability issue is very important. We've been working with a lot of our larger customers to develop a unique ability to do Active/Active failover. We actually have customers that have applications that are running real-time across multiple data centers. So, in the case of not just the application going down, but an entire data center going down, they would have no loss of continuity of those resources. That’s a pretty extreme example, but it goes to the point of how important meeting some of those metrics are for businesses and making that cost justification. Gardner: We started out with some cynicism, risk, and myths, but it sounds like private clouds are a stepping stone, but at the same time, they are attainable. The cost structure sounds very attractive, certainly based on Rick and Ajay’s experiences. Jay, where do you start with your customers for Platform ISF, when it comes to ease of deployment? Where do you start that conversation? I imagine that they are concerned about where to start. There is a big set of things to do when it comes to moving towards virtualization and then into private cloud. How do you get them on a path where it seems manageable? Muelhoefer: We like to engage with the customer and understand what their objectives are and what's bringing them to look at private cloud. Is it the ability to be a lot more agile to deliver applications in minutes to end users or is it more on the cost side or is it a mix between the two? It's engaging with them on a one-on-one basis and/or working with partners like Agilysys where we can build out that roadmap for success and that typically involves understanding their requirements and doing a proof of concept. Something that’s very important to building the business case for private cloud is to actually get it installed and working within your own environment. Look at what types of processes you're going to be modifying in addition to the technologies that you’re going to be implementing, so that you can achieve the right set of pooling. Something that’s very important to building the business case for private cloud is to actually get it installed and working within your own environment. You’re a very VMware-centric shop, but you don’t want to be locked into VMware. You want to look at KVM or Xen for non-production-type use cases and what you’re doing there. Are you looking at how can you make yourself more flexible and leverage those external cloud resources? How can you bring physical into the cloud and do it at the right price point? A lot of people are looking at the licensing issue of cloud, and there are a lot of different alternatives, whether it's per VM, which is quite expensive, or other alternatives like per socket and helping build out that value roadmap over time. For us, we have a free trial on our website that people can use. They can also go to our website to learn more which is http://www.platform.com/privatecloud. We definitely encourage people to take a look at us. We were recently named the number one private cloud management vendor by Forrester Research. We are always happy to engage with companies that want to learn more about private cloud.